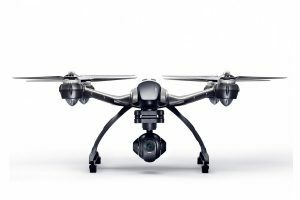 Yuneec is a company that makes an assortment of different drones that you are bound to enjoy. 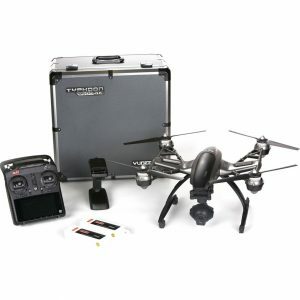 The Typhoon Q500 is a quadcopter drone that stands out as a choice that is easy to fly and pilot anywhere with the remote control and offers enough support for a variety of demands when you’re up in the air. 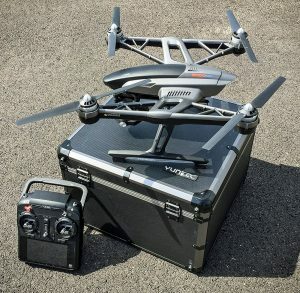 The Yuneec Typhoon Q500 isn’t just easy to fly, either. 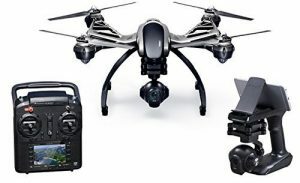 It’s a drone that has an ultra-high definition 4K camera with microSD card and one of the best aerial photography recording schemes around. The smart mode also gives you more flying control over how well the drone may work. 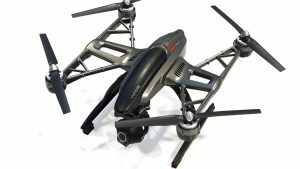 No matter what your plans for using a drone might be for, this model will surely do well for your demands. You should see just how well it can be used in any situation you have it for. Unlike many other drones where you would have to add your own camera onto its body, you can get the camera built within the Yuneec Typhoon Q500 to take strong pictures for you every time. The drone uses a 4K camera that shoots intense video with some of the best displays around. This camera, in particular, is the CGO3 model. It uses several processors to record 4K audio that is more detailed than traditional HD signals. It can also capture 1080p or 120fps slow-motion images and even 12-megapixel photos. This supports some of the most detailed shots that you will ever get. This camera works on a 3-axis gimbal. It can move in many angles and can even be tilted in different directions depending on your demands. You can even tilt the camera 90 degrees down if needed. This would display everything directly underneath your drone, a point that might be perfect if you want to spot things right in an area. You can also use a SteadyGrip handle on the camera when the drone is not in use. It helps you to get ground shots that are just as detailed and steady as what you’d get out in the air. There are also controls for the white balance and light exposure features on the camera. It gives you more control over how well the camera works in a number of conditions. This is all perfect when you consider the great technical features of the drone. It can move up and down by at least 2 meters per second. It can also go up to 400 feet in the air. In terms of speed, it moves at about 8 meters per second. Considering how the camera continues to shoot great and clear images even as it moves quickly, it will not be too hard to use in some way. It goes fast enough to shoot images quite well without otherwise being too tough to use. You can use this drone with the Follow Me feature in mind. This allows the drone to follow your controller within a certain distance. It identifies the distance between you and the controller and maintains it no matter where you go. The Watch Me feature also helps as the camera identifies a certain object that you want it to follow. It will move the camera around to focus on different items as needed. This establishes a better sense of focus on your camera so it will work quickly and effortlessly. It can also return home to you after it runs out of battery power. As it reads that it is nearing the end of its charge, it will head back to where the controller it. It will get there within about 10 to 20 feet of where the controller is. It keeps you from having to go out there to retrieve your drone in the event that it runs out of power. The 11.1V LiPo battery that comes with the Yuneec Typhoon Q500 provides you with about 25 minutes of flight time on a full charge. It is also light in weight so it will not struggle to stay up in the air. You can even get a second battery added if you order this drone with an aluminum carrying case, thus ensuring that you have another battery to work with while the other is charging. The remote on this drone is especially popular. It uses a 5.5-inch display screen that shows what is on the camera in real time. You can also use this to identify where it is located, how fast it is going and so forth. The design also lets you control the drone camera based on its positioning. The controller uses two separate antennae to keep a connection going. It uses 2.4 and 5.8 GHz connections alike. You can also download the separate CGO3 app onto your mobile device. This lets you look carefully at what is up in the air in real time and can work in just a matter of moments. One popular feature of this drone is that it supports a dual-remote setup. Two separate ST10+ transmitters can be used here. One transmitter can be bound to the drone while the other is linked to the camera. This allows one person to control the drone while the other focuses on what the camera spots. This is a useful feature that simplifies how the controls are run and gives two people easy support for moving it out well enough. The carrying case that can be ordered with the drone is optional but can easily do more for your transport needs. The Typhoon Q500 case is made with a lightweight aluminum body. It also has a foam cushioning surface to ensure the drone and all other parts are fully protected. As mentioned earlier, this comes with a second battery. 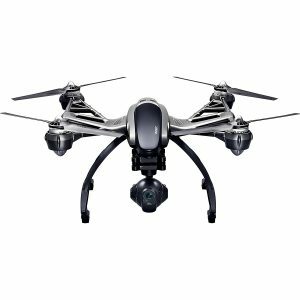 In summary, you should look at what the Yuneec Typhoon Q500 can do when you’re aiming to find a quality drone that can at a far distance. It is a powerful choice that offers great and detailed shots of everything you see in a spot. It is easy to use and gives you many control options. What top 3 drones do you recommend for a beginner adult .